Fremont, NE - The urge to grill is unpredictable, equally likely to strike a chef in their own backyard as it is to come upon an angler camped out at the perfect cove. Campers with a cooler of meat but no empty grills, boaters whose current drove them to a distant shore at dusk, or hunters set up in a secluded blind and unwilling to move through multiple meal times - these folks deserve a grill that can go on any adventure and be used virtually anywhere. These folks deserve the GameMaker Gravity Grill™. The new GameMaker Gravity Grill & Skillet Combo™ from CanCooker™ is an ultra-portable, heavy-duty grill that can be set up almost anywhere in just a few seconds without using any tools. The system is compatible with any source of heat or fire - charcoal, wood, propane, turkey burner - and adjusts for a wide variety of cooking situations with nearly 300-square-inches of instantly available cooking space. Inspired by campout cooking, the secret of the Gravity Combo's versatility is it's efficiency of design. A 3-foot-tall stake is driven into the ground, then the Grill and Skillet are attached and adjusted in seconds with a "lift and set" process - no screws or other hardware required. Even during use, the heights of the grill and skillet can be easily adjusted because gravity and leverage are doing all of the work, while hunters, anglers and campers get all the benefit. Because it's so simple and portable, the system is also incredibly versatile, even mid-meal. 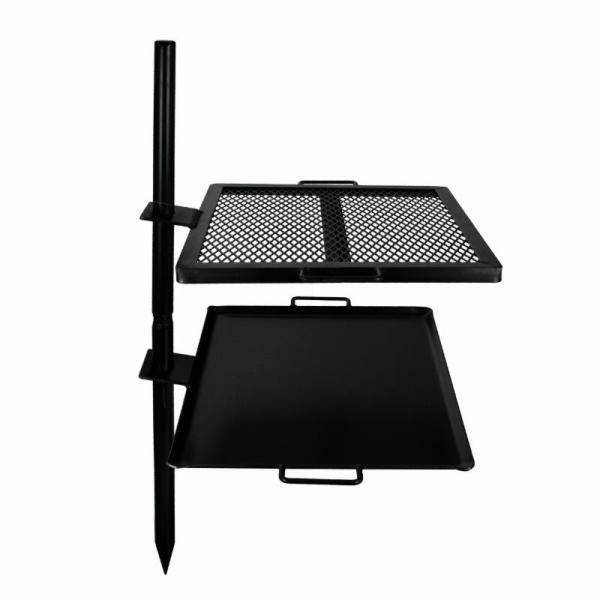 The Grill & Skillet combo provides two cooking surfaces to make multiple items at the same time, or, if needed, the ability for the grill-master to turn the skillet surface away from the heat to use as a prep table or cooking station. Some situations might not allow for a fire, and that's ok too. Tailgaters or other parking-lot chefs can can combine the portability of the Gravity Grill with the ease of the CanCooker™ with multi-fuel burner and cook the best pot of chili in a record amount of time. On the other end of civilization, campers who want to "leave no trace" can keep their fuel source elevated and contained by using the heavy-duty skillet as a charcoal holder, with the grill positioned just above the heat for cooking. 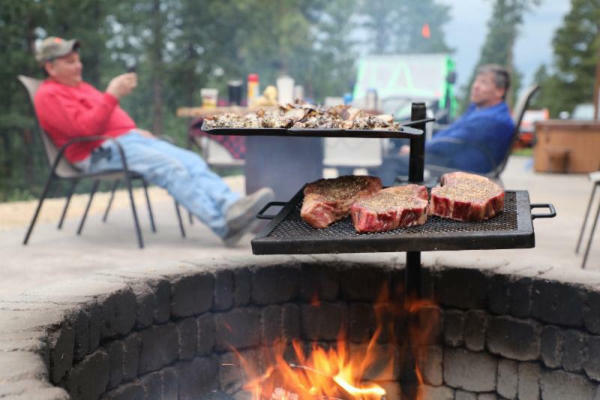 Even if you choose to stay in the comfort of your home but enjoy to cook outside the Gravity Combo™ works great over a fire pit or fire ring. For those who get out there and value their own freedom and independence to grill wherever their adventure takes them, Seth McGinn created GameMaker™ Gravity Combo™. Grill dimensions: 18.5" x 16.375"
Skillet dimensions: 18.625" x 15.625"
In 2009, Seth McGinn's CanCooker revolutionized cooking in old-fashioned-creamery-style cans. Headquartered in Fremont, Nebraska, CanCooker Inc.'s unique outdoor cooking device allows you to cook a large amount of food quickly. The lightweight, high-strength aluminum construction and latch-closed, silicon-sealed lid ensure years of hassle-free enjoyment. The CanCooker is perfect for everyday life, weekend life, and adventure life.